For its sixth year at Piazza Maggiore, Turkish Ceramics Promotion Group invites Cersaie visitors to the Fahir Atakoğlu Symphonic Project with the Filarmonica Arturo Toscanini which will take place at Bologna City Center on 25th of September. Ceramic production in Turkey has a long history and rich tradition, with the first ceramics being created in Anatolia over 8000 years ago. Today, Turkish ceramic producers are proud to continue this tradition of innovation with a creative approach and a broad range of high quality and durable products for both the professional and consumer markets. Representing over 33 individual companies, Turkish Ceramics Promotion Group aims to raise awareness of Turkish ceramics abroad and communicate the quality of Turkish ceramic tiles and sanitary ware. In this regard, for its sixth year at the leading ceramics fair of the world, Cersaie (International Exhibition of Ceramic Tile and Bathroom Furnishings, 23-27/09/2013 Bologna Fiere), Turkish Ceramics Promotion Group presents another enchanting concert on 25th of September. 23 leading Turkish ceramic companies will also participate to the fair to demonstrate their latest collections. By participating Cersaie with organizing memorable concerts since 2007, this year Turkish Ceramics Promotion Group will organize another unforgettable show by blending Western music with Eastern melodies. An international award winning composer and pianist Fahir Atakoğlu is well known in the fields of large symphonic works and film music. 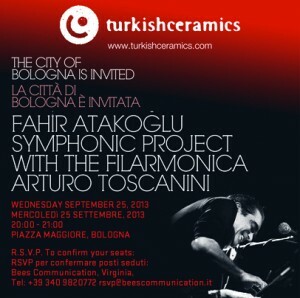 Turkishceramics invites ceramics professionals to enjoy Fahir Atakoğlu symphonic project accompanied with Italy’s leading symphony orchestra the Filarmonica Arturo Toscanini on 25th of September at Piazza del Maggiore, Bologna City, at 20:00-21:00. 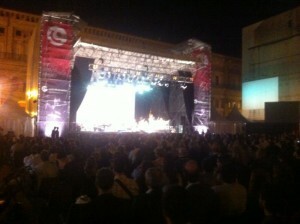 Turkishceramics continue confidently to its promotion activities in light of the targets. Currently being the world’s 4th biggest exporter in ceramic tiles and having a ceramic production capacity of over 2 billion Euros, Turkey is also the largest producer and exporter of sanitary ware in Europe. In order to support Turkish Ceramics exportation around the world and increase the awareness of Turkish ceramics, Promotion Group continues confidently to organize different promotion activities more focused on target countries and target groups. Making its United Kingdom debut at 100% Design 2013, Turkishceramics is the lead sponsor of the new International Pavilion at this year’s event. Turkishceramics is collaborating with London-based architect and interior designer, Ferhan Azman, founder of Azman Architects, to design Chockablock, a ceramic installation for the International Pavilion that will provide a bar, meeting areas, a private events space and a VIP area. This entry was posted in Home and tagged 100% Design, ceramic tiles, ceramics, cersaie, fahir atakoglu, turkishceramics on 2013/09/27 by admin.